Área Santiago is a group of sixteen municipalities in the area of Santiago de Compostela, which work together in tourist promotion. The territory of Área Santiago, which is so called due to its location in Santiago de Compostela’s area of influence, covers the south of A Coruña province and the north of Pontevedra province, both separated by the natural border of the River Ulla. It encompasses sixteen municipalities of inland Galicia: A Estrada, Arzúa, Boqueixón, Lalín, Melide, O Pino, Oroso, Padrón, Rois, Santiago de Compostela, Silleda, Touro, Trazo, Val do Dubra, Vedra and Vila de Cruces. It is an area profoundly defined by two of Galicia’s main water resources, due to their volume of water as well as their rich fauna, flora, landscape and culture: the Ulla-Deza River System, which delimits the south, and the River Tambre and its tributaries, which demarcate it in the north. It is therefore a river area, intensely defined by the numerous rivers flowing through its municipalities, which is not surprising since Galicia is the “land of a thousand rivers” (Galicia has more than 20,000 linear kilometres of interior coastline). The River Ulla, rich in trout, salmon, lamprey and sea trout is, in terms of length (132 km) and volume of water, the third in importance in Galicia. Its main tributaries also stand out in the identity of Área Santiago: the Deza (51 km), the Toxa (17 km), the Liñares (15 km) and the Furelos (26 km). The second river basin in importance in this area is that of the River Tambre (134 km) and its main tributaries: the Dubra (15 km) and, above all, the Lengüelle (27 km), the three of which abound in trout and chub in the territory of Área Santiago. Apart from their variety of fish, the characteristics of these rivers guarantee the presence of varied fauna as well as exuberant and diverse flora, made up of riverside plants and trees and colourful aquatic species, in addition to an important unknown heritage of waterwheels, weirs, millponds, trails, etc., which are of unquestionable interest to travellers interested in the world of nature. As a visit to the website www.AreaSantiago.es shows, cultural (with “pazos” or country manors as the main example), ethnographic (in which several festivals declared to be of tourist interest and featuring ancient traditions stand out), religious (with countless churches as well as monasteries, especially Romanesque ones, and with the Way of St. James network that runs through the entire area), gastronomic (represented by delicious wines and cheeses, trout, salmon and lamprey, but also by garden products and renowned meat and cured meat…) and above all natural heritage, as mentioned above, are the area’s main attractions; these are sufficiently profound and interesting to make Área Santiago an evocative multiple destination. This, along with an outstanding range of rural accommodation and authentic bars and restaurants, will undoubtedly make up a new tourist attraction that will “naturally” complete that of the city of Santiago. The group of sixteen Área Santiago municipalities met for the first time on March 11, 2013, at the initiative of Santiago City Council, which invited the municipalities in the surrounding area and three from Pontevedra province, with which it had been working efficiently in a network for the joint tourist promotion of the Traditional Rural Carnival of the “Xenerais da Ulla”. After this first gathering, other municipalities in the surroundings asked to join, until the present total of eighteen was attained. The founding of this group was made official on May 27, 2013, with the signing on the part of these municipalities’ 19 mayors of an “Intention Protocol for Collaboration in Joint Tourist Promotion”, a union that is considered beneficial for all signatory municipalities due to the possibilities arising from the tourist attraction of Santiago de Compostela, Galicia’s main destination. 4. and therefore increase the number of visitors and overnight stays in the Área Santiago destination/multi-destination. During all these years, the group has been able to plan the touristic promotion of destination, this is thanks to the Comisión Mixta's work, formed by technical staff and the the councils politicians that belong to the group. They have aproved anual plans to consolidate Área Santiago, as a turistic destination reference regarding fluvial tourism, gastronomy, packages and trips. • 36 BIC (Properties of Cultural Interest): buildings, monuments, historical gardens, historical ensembles and historical. • 6 Natura 2000 SCI (River Tambre, O Careón Hills, Sobreirais of the River Arnego, Ulla-Deza River System, Brañas de Xestoso and O Candán Hills). • 9 Way of St. James routes (French Road, “Vía de la Plata,” Portuguese Road, Fisterra Road, English Road, North Road, Original Road, Mar de Arousa and Río Ulla Route and Winter Way). 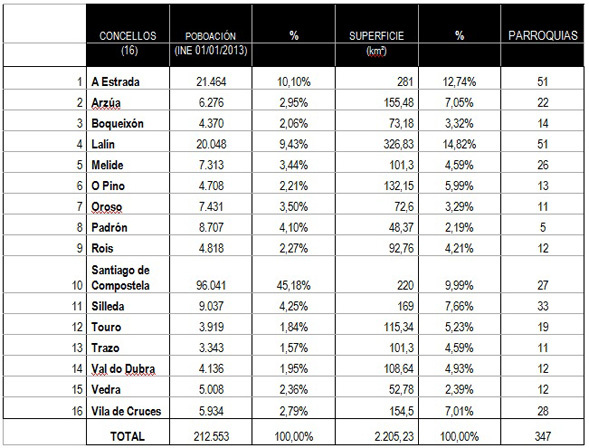 • 109 “Pazos” (country manors). • 1 Natural Monument, declared to be such: Fraga de Catasós. • 14 Festivals of Tourist Interest: 2 International, 1 National and 11 Galician ones. • 88 Rural Tourism Establishments. • 11 Public Pilgrim Hostels. • 4 DOP (Protected Designations of Origin): RíasBaixas (Ribeira do Ulla Sub-zone) Wine, Arzúa-Ulloa Cheese, “Tetilla” Cheese, Herbón Peppers. • 6 IGP (Protected Geographical Designations): Galician Ham Foreleg, Galician Veal, Galician Chestnuts, Galician Honey, Galician Turnip Tops and “Tarta de Santiago” (almond cake). • 1 Geographical Designation: Galician Marc /Galician Eau-de-vie. • 131 CRAEGA products (Galician Regulatory Council of Ecological Agriculture) products, from 47 producers. • 71 members of “Artesanía de Galicia” (Galician Craftwork): 65 artisanal workshops and 6 shops. • 72 outstanding Fishing Areas: 25 Fishing Preserves, 6 No-Kill Sections, 41 Recommended Areas.